I made something quite similar with almond milk and love it too. Have to give your recipe a try soon as I love the add of coffee liquor. This sounds wonderful, though I don't have a special blender....here in the Midwest we are just heading into hot cocoa, and for my dairy free daughter in law, this might just be the right treat! Thank you for leaving a comment on my blog, the llamas are sure fun to have next door! Angie, thank you. I still haven't tried almond milk. I don't know why -- I love almonds. Must pick up a carton today. Thanks, Anita. I'm sure you can get the same effect pouring it into a countertop blender or even whisking by hand. Between your spartan tastes and my jaded ones we are keeping the universe in balance, Jeani. I like a little hot chocolate in my sugar. And the appetite for chocolate is 24/7/365. One mood. Best described as constant and voracious. Hot chocolate is fireside stuff, but I have yet to try fire-eating itself (you see, there is some discipline in my feasting). Nothing like kicking back beside a roaring fire, sipping hot chocolate…after skinny skiing for two hours in the frosted forest. The requisite tryptophan/dopamine/oxytocin et al triggers and neurotransmitters will only happen if you stoke the boilers out on the trails! As for immersion blending, heck yeah, sounds much better than my current method, i.e. take mouthful of hot chocolate, swill until frothy, gulp down. Oh, I just love proper etiquette! 5 cleavers for anticipating an enchanted après-ski by the hearth, as my inamorata once described it. Sully, thank you. And I am just excellent at that whole apres-ski thing. It's my best winter event, my best sport. Your timing couldn't have been better! You did time this for me, right??? I love hot chocolate this time of year and have recently found out that I'm lactose intolerant. Thanks to you, my immersion blender is going to be very busy! Jacqueline, thank you! (Great minds think alike -- and all that!) Let me know how you like it. :D Yes, Joanne, you can "suffer along" with a regular blender or just a wire whip! Sometimes make a hot chocolate drink but don't put it in the blender.. Thanks, Margaret. Try the blender sometime and see what you think! Jean, your hot chocolate sounds lovely especially with some coffee added. I don't own an immersion blender although my son gave me a hand blender for my birthday. I suppose it would do the trick. Don't tell him, but I haven't even used it yet. Thanks for sharing your recipe and enjoy the weekend. I don't have an immersion blender, but love hot chocolate. You put me in the mood. That does sound great! I have a respiratory dairy allergy, so drink/use only almond milk. This sounds great! Thanks for posting to Tuesday Cuppa Tea! Yes, Linda, it is the time of year when a cup of hot chocolate really sounds good! Try just whisking it for a minute before pouring it into the cup. I really think it makes a difference. Thanks, Ruth! I'm sure it would be good with almond milk as well. I'm going to pick some up today and try it. Oooooh! Yum, Yum, Jean!! I like using the immersion blender. That should really do the trick. I wonder if I could use coconut milk. 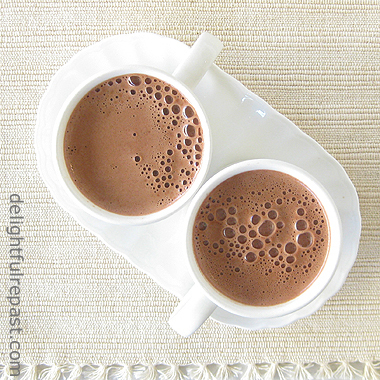 I probably have hot chocolate once a decade, but I might like to try this on Christmas Eve! BEAUTIFUL photo, btw. Thank you, Judy! Glad you like the photo! 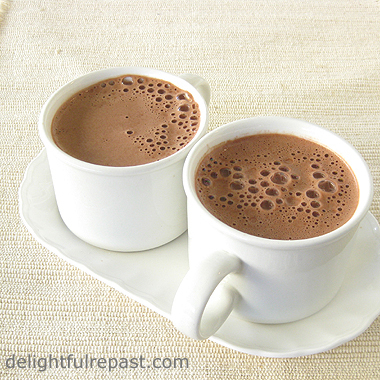 If you do try this for your once-a-decade hot chocolate, let me know how you liked it. I'm loving the immersion blender. Thanks, Greg! My French that is not completely menu- or wine-related is pretty rusty! Hot chocolate with a frothy texture? That would be like drinking a semi liquid chocolate mousse, I think. Delightfully yummy. I failed French in school, mostly because I hated the teacher. Gracias, Rosita! So good to hear from you -- it's been a while! Thanks for the suggestion, Amy -- I do love brandy in lots of things! That's a great description, River! I dropped Spanish after switching to a school with a bad teacher (his pronunciation was horrible and he leered at the girls!). What a delicious, grown-up sounding hot chocolate. Yum! Thanks so much, Kim! I'm looking forward to my upcoming dairy-free experiment. But it will require some planning. I have a friend who has a serious dairy allergy, so this looks wonderful. Thank you so much! Pinned. Leigh, thank you! I hope your friend will enjoy it. Pin is much appreciated, too! Rambling Tart, when you try it, do let me know how you liked it. You could also pour it into a regular blender, but that's just way too much mess and bother! Miz Helen, thank you so much! I'm going to be checking out your latest -- the pumpkin recipes -- this afternoon. Can't wait! What a delightful alternative for people who are dairy allergic! This looks so delicious! So glad you shared as some really need this! Thanks, Bernideen! I hope some with allergies will really enjoy it. AND I hope you've got lots of good helpers to assist with packing up all your lovely things for the move! Thanks, Dee. It *is* just like regular hot chocolate, and you can adjust the amounts of everything to suit yourself. I made some the other day for a real chocolate fan, so I doubled the amount of chocolate chips. If you get an immersion blender, you'll soon find a lot more uses for it besides just this!